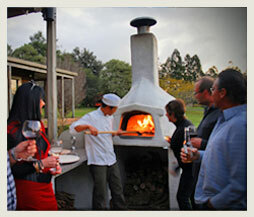 Resident Chef Mutsuo Hatada can cook up a delicious wood fired pizza by arrangement. After a great night sleep, awaken to a lavish cooked breakfast with fresh eggs kindly donated by the resident chooks or, for those who prefer, a continental selection is also on offer. Please advise any special dietary requirements when booking. Resident Chef Mutsuo has cooked at some of New Zealand’s finest establishments and will cook dinner by arrangement. Please advise him when you make a booking (least 24 hours notice), if you are dining in house so that he can discuss your menu and budget. This will also ensure he has plenty of time to gather fresh produce from the organic garden (uncertified) or from the local market. After dinner relax with a glass of local wine or port in the lodge lounge (we’re a licensed facility), or recline in the spa pool on the deck. Our executive chef Mutsuo focus on the use of the finest fresh local produce, including herbs and vegetable picked from the Lodge's organic garden.